"Receive, My Dear Son, The Scapular... "
"Receive, my dear son, the Scapular which I present to you and to your whole Order; it is by this that I wish you to be recognized in the future as my kindred, my brothers; it is a sign of predestination, a token of peace and of AN ETERNAL COVENANT. Whosoever has the good fortune to die with this mark of my love shall not suffer eternal fire." Every single person who has ever written or called this Center for information regarding the Garabandal Apparitions has found included in our mailing, the Brown Scapular of "Our Lady of Mount Carmel." These scapulars are also given freely at all of my Slide-Lectures. It is estimated that well over one million have been distributed throughout the world since 1964. All of our scapulars are hand-made by our volunteer sewers, blessed by a priest and then touched one-by-one to a rosary or picture or book actually "kissed" by Our Blessed Mother during Her more than 2000 appearances at Garabandal to four 11 and 12 year old girls from 1961-1965. Although The Virgin Mary's coming to Garabandal was announced ahead of time by Michael The Archangel as "Our Lady of Carmel"...and She did appear with the brown scapular many times...the Carmelite Brown Scapular is not a new sacramental or devotion in the Church. The Carmelite Order, was known in its early days as: "Brothers of The Order of The Most Blessed Mother of God and Ever Virgin Mary of Mount Carmel." They claimed an organic descent from hermits living on that mountain in Palestine, under the direction of the Prophets Elias and Eliseus (873-854 B.C.). For practical purposes their history may be taken to begin in 1155, when a hermitage of western men was founded there by St. Berthold. In the year 1238, mounting difficulties were threatening to overwhelm Our Lady's Order and during the war of the Crusaders, lariauc Saracens had driven the Community out of their ancient and honored home. The helpless priests and brothers wandered through Europe, unknown and unwanted. In new and hostile surroundings, they struggled vainly to survive. It almost seemed as though Our Lady's Order might perish forever. 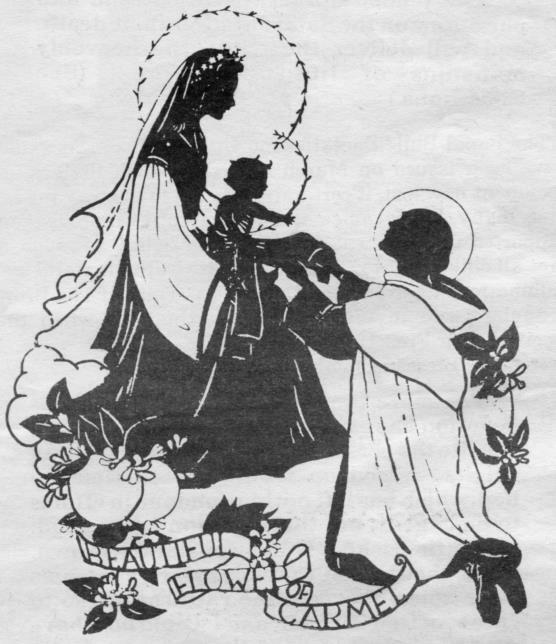 "O beautiful flower of Carmel, most fruitful vine, splendour of Heaven, holy and singular, who brought forth the Son of God, still ever remaining a pure Virgin, assist me in this necessity. O Star of the Sea, help and protect me. Show me that thou art my Mother!" Like wildfire, Our Blessed Mother's Promise spread throughout Europe. Everywhere, people of all walks of life popes and bishops, kings and lay people, heralded Our Lady's generosity and appealed to be invested with the Carmelite Brown Scapular with numerous miracles and prodigies being attributed to it. Her Order enjoyed a new rebirth. According to Blessed Claude De La Colombiere, S.J. : "This first fervor was much increased by the elevation of John XXII to the Papacy. For The Blessed Virgin in a previous vision had promised that he would be Pope on condition that he would authorize the devotion of Her Habit, which had, until then, rested upon faith in a particular revelation. He did in fact so authorize it by a Bull in which he inserted the story of this apparition." The Papal Bull "Sacratissimo Uti Culmine" was said to have been issued on March 3rd, 1322. With the original document now lost, it certainly does not take away the fact that many Popes since then have fully approved and supported this virtuous tradition and belief, so much so, that all children throughout the entire Catholic world were automatically enrolled in the "Confraternity of The Brown Scapular" and invested with it at the time when they received their First Holy Communion. "For more than four hundred years this devotion has existed in the Catholic Church, despite the persecution of proud and wanton spirits, raised up from time to time by hell, which has left nothing undone in efforts to damage it; but this devotion has spread; it has flourished; it has constantly grown. What, then, is left to render Mary's promise more solemn, except the ratification, so to speak, of God Himself; and I would now have you heed the voice of the Supreme Truth speaking in favor of the Scapular through miracles." "The Scapular devotion is a secure way to assure oneself of the protection of The Blessed Virgin; She has strictly obliged Herself to safeguard those who wear this holy habit; we still more strongly oblige Her to do so from the moment that we adopt this devotion." 1) To be enrolled in the Scapular Confraternity once,and to wear the scapular at all times. 2) To be pure, observing the 6th and 9th Commandments. 3) To perform some practice in honor of Mary which an authorized priest will assign you.